I hadn't made any plans for Easter weekend, and without plans, I tend to procrastinate. 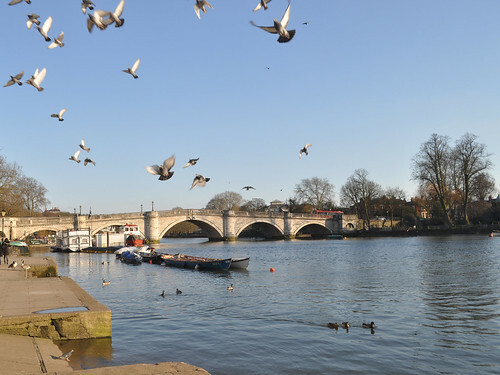 So it was that it was already late afternoon by the time I eventually spurred myself out of the house, and with little time before the sun set, I opted for a nearby reliable favourite place to stroll: Richmond. 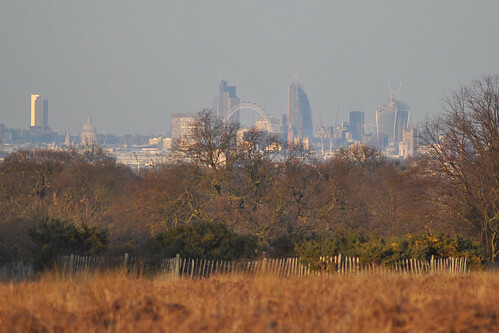 It didn't let me down, with a mix of classic views delivering as expected, and a few happy new chance sights too. 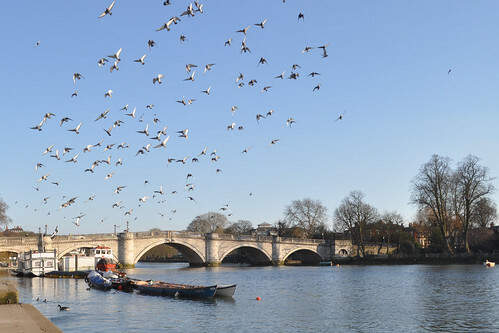 The first of these came as soon as I emerged onto the waterfront: a large flock of birds wheeling in the blue skies over Richmond Bridge. 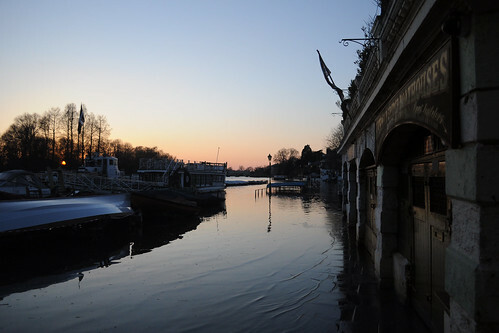 I headed down the riverbank past the boat clubs as far as Petersham Terrace, which I scaled to admire the famous view back down to the Thames. 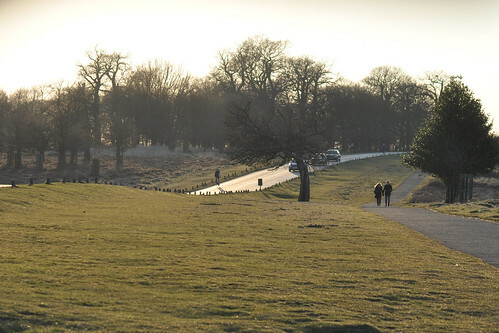 Up to Sawyer's Hill in the corner of Richmond Park, glowing brightly in the late evening sun. 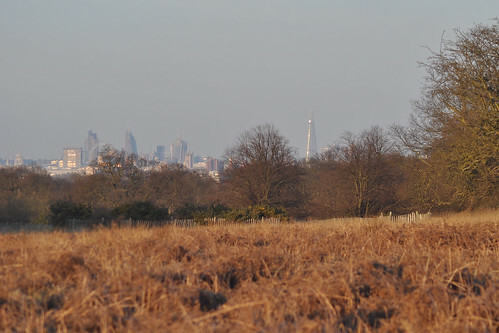 The obligatory long lens efforts to capture the Shard and City of London skyline, frustrated as almost always at this time of day by the slight smoggy quality of London air. 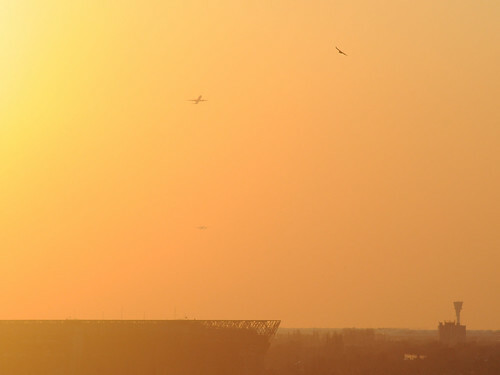 Nonetheless, the Shard was putting on a good show, living up to its name as I have rarely seen it before. A single edge catching the sunlight, it looked sharp enough to cut even from some 9-10 miles away. The orange light of the descending sun was throwing the burnt bracken and bare branches of the trees into vivid autumnul colours, and offering little warmth to offset a lively breeze. It didn't feel like spring. 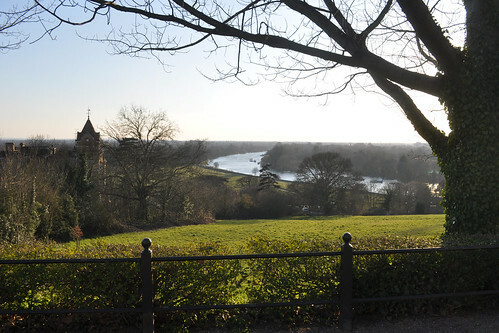 Time to head back to the westward view from Richmond Hill to capture the sunset. 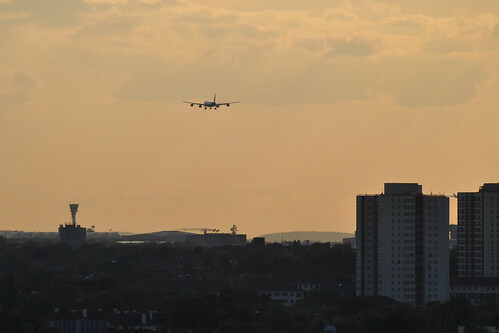 Just under a year ago I'd taken this photo, right, of a plane descending into Heathrow from a vantage point on Richmond Hill. While quite happy with the photo, I fancied another crack at it. I immediately realised that an exact recreation was not going to happen, since the runway was operating in the opposite direction today. I didn't really care, and snapped away as a series of planes took off. 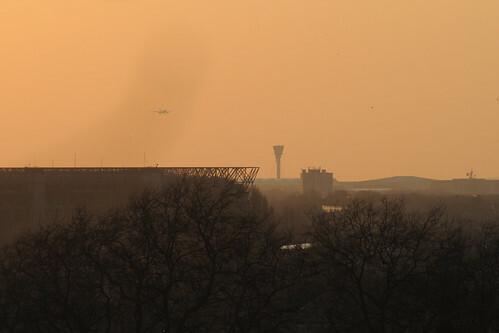 In the end, I had a slightly orange-er sunset, the sharp lines of Twickenham Stadium, and a whimsical "is it a bird? is it a plane? it's both" combination, and I was quite happy again, but didn't feel I'd especially outdone my first effort. There is still scope for a better shot from here, but for now I descended back to the waterfront. 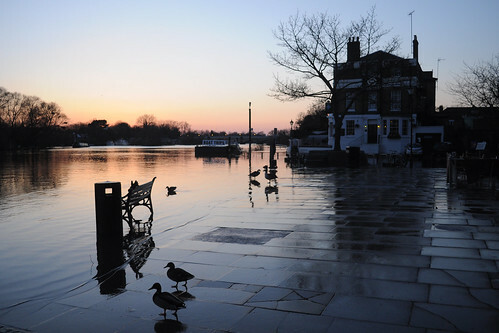 Dusk was spreading over Richmond, and so was the Thames. 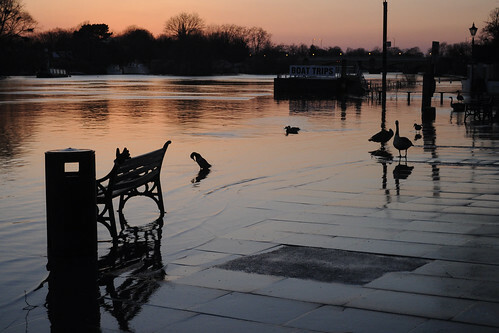 An unusually high tide saw the river lapping over the riverfront footpath. As usual, I felt slightly frustrated for not capturing such a photogenic scene with the sort of quality shot it deserved, but pleased for being there and having a stab and getting some not entirely rubbish results. 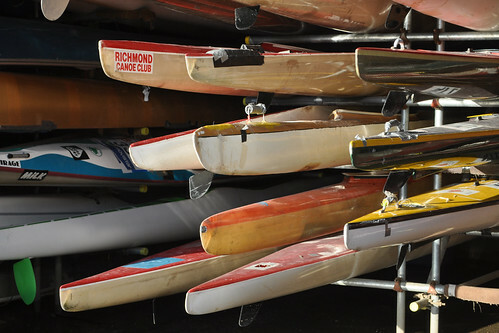 If being there is half the battle, then hopefully being there and remembering to focus is at least three-fifths.